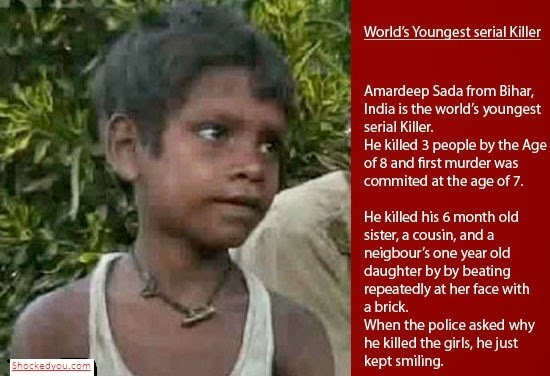 An eight-year-old boy was being described as "India’s youngest serial killer" after he was charged with the murder of three children, including his sister, who were all less than one year old. Armadeep Sada, the son of an impoverished Indian couple, was produced in court today accused of the murder of a six-month-old girl, Kushboo, who he is alleged to have abducted last Tuesday and two other children.Kushboo’s mother, Chunchun Devi, said she had left her daughter to sleep at her village primary school while she attended to household chores and returned to find she had disappeared. When villagers confronted Sada he is alleged to have confessed to the murder, leading them to the place where he had attempted to conceal the body in a shallow grave, local reports said. After his arrest police said the boy had then confessed to the murder of his eight-month-old sister three months ago and his six-month-old cousin, the daughter of a maternal uncle, almost a year ago.Superintendent Amit Lodha, from the town of Begusarai, 90 miles east of the Bihari capital, Patna, said the boy appeared to be a psychiatric case and was now being evaluated by professionals. An uncle of Sada’s told local media that the earlier two killings had been known to the family and some villagers, but had not been reported since it was considered a "family matter". Inspector Shatrudhan Kumar of Bihar police said that all the killings had been carried out in identical manner. “He said he took the children to the fields and hit them with a stone and killed them. He has been charged with murder” he added.